New! 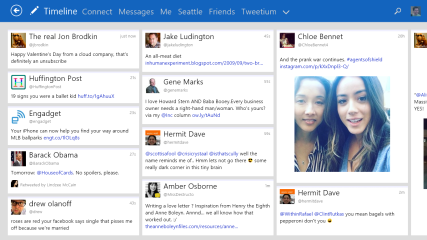 Read about Tweetium Pro! See what's new in version 3! 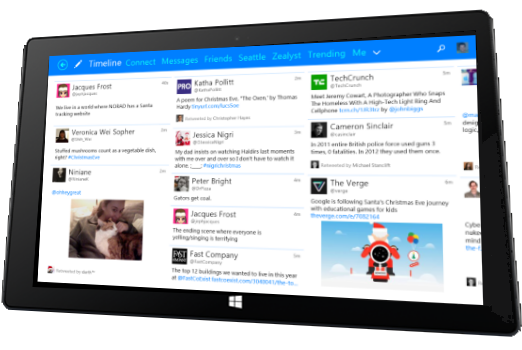 Tweetium evolves the user experience pioneered by our first app, Newseen. Inspired by Metro but distinctly ours, this design strives to get you the most out of Twitter with the least amount of effort. It feels at home on any device, in any orientation, regardless of whether you're using touch, mouse, or keyboard. 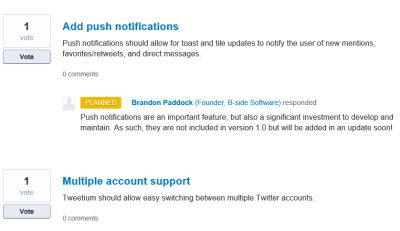 Tweetium is first and foremost designed to be quick and reliable. All B-side Software apps have a special focus on fundamentals like performance and reliability, and Tweetium is a prime example of this. With its fast, modern UI, and multi-threaded sync and streaming architecture, you won't find a more fluid Twitter experience anywhere. Tweetium's robust streaming and smart connectivity handling provide you with a live, connected Twitter experience. Whether it's the main view always being up-to-date, or conversations where replies pop in instantly, Tweetium is built to make keeping up with your twittersphere effortless. Tweetium is brand new. We strived to provide everything you need in our first release. But we know that no software project is ever truly finished. Is multiple account support critical for you? Push notifications? TweetMarker? Help us know what to focus on for our next update by voting or adding suggestions on our UserVoice page.